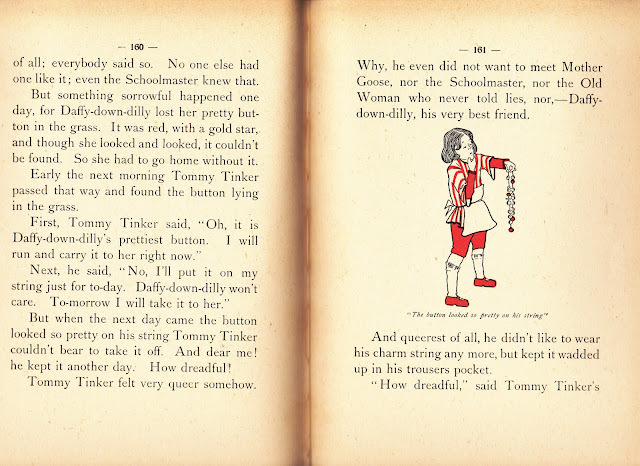 In her preface to Stories of Mother Goose Village, Madge Bigham tells of first hearing nursery rhymes, then getting her own Mother Goose book, which led to her reading it until she almost wore it out, and then her desire for still more. The very predictability of nursery rhymes is why they are an important step to beginning reading, but that imaginative nonsensical playfulness is what captures our attention. Little Madge wanted still more, but was told "the dear old lady wrote only the one." When that made young Madge sad, however, she was wisely told, "But never mind, when you grow into a great big girl, my dear, you may write another one and tell some more about Humpty Dumpty and Jack-be-Nimble and little Miss Muffet and all the rest." What great advice! Parents, teachers, storytellers, encourage your listeners to continue creating adventures for these beloved characters. There's a Biblical tradition of creating stories beyond the sacred text. Those stories are called Midrash. Surely the literature of Mother Goose and other classics deserve similar encouragement. Fortunately Ms. Bigham (and earlier I posted a similar story by Frank Baum) remembered that challenge. It is still worth encouraging. 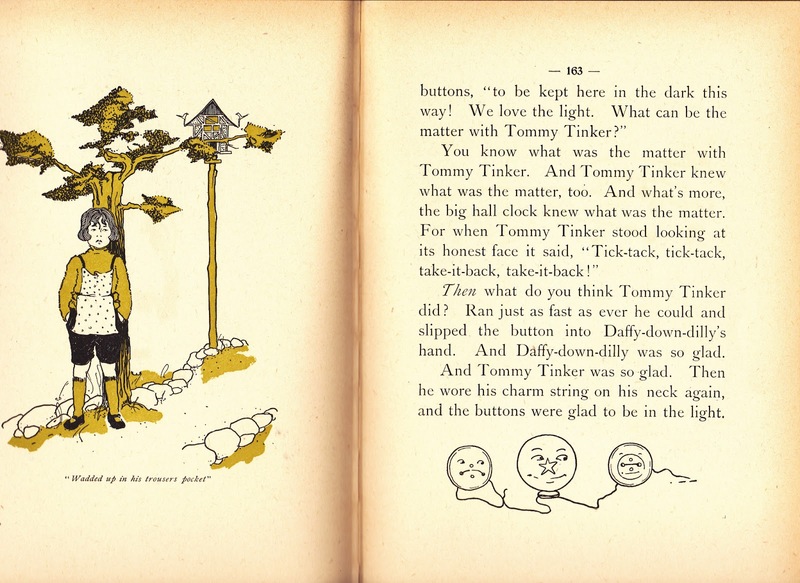 Stories of Mother Goose Village is filled with many of the favorite nursery rhyme characters, but there could always be more. I also love how many stories are holiday tales, like the Old Woman Who Lived in the Shoe having both the tale of her Christmas tree and her New Year's basket. 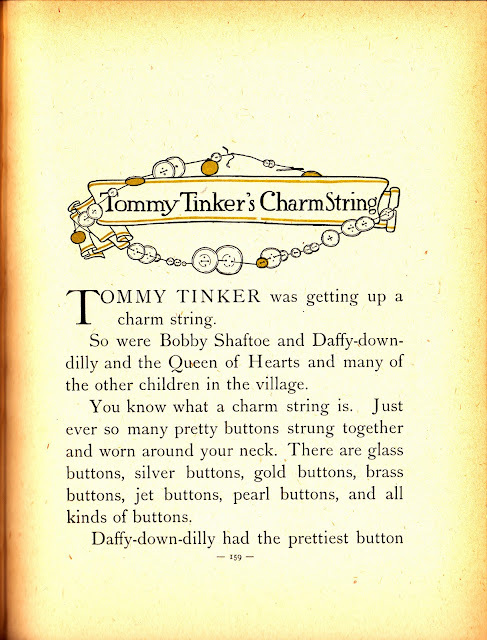 There's Little Miss Muffet's Valentine and Mother Hubbard's Easter Lily, she also gives another valentine tale and even sneaks Cinderella in, saying "Cinderella did not live in Mother Goose Village, though she often went there." 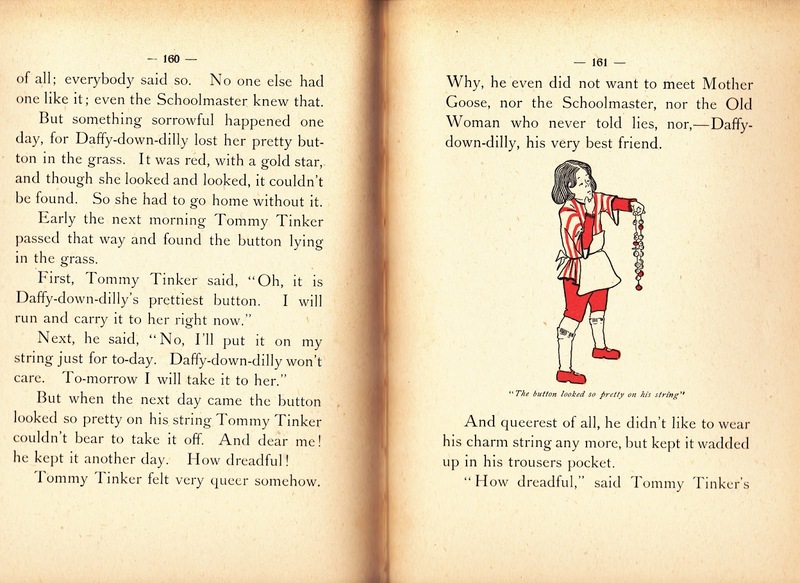 Jack and Jill get a birthday story and other stories sometimes include parties and picnics.They also give a look at earlier customs and games. The concept of a"charm string" may need its brief explanation, but surely everyone has felt the tug of "finders keepers." The emphasis on the positive makes for a pleasant, low-key resolution. The next story will be "something completely different" as it is a story from the Civil War. With all the sesquicentennial interest, surely those stories, too, deserve to be kept in the Public Domain.